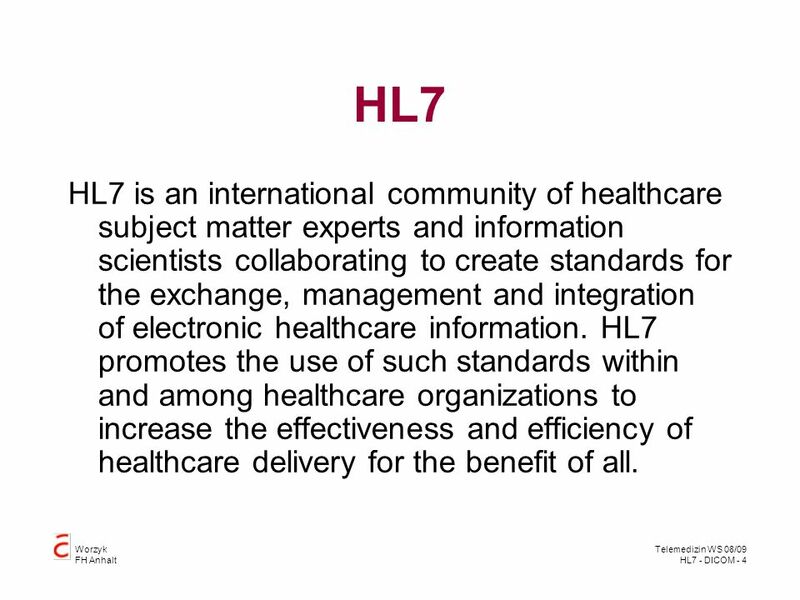 4 HL7 HL7 is an international community of healthcare subject matter experts and information scientists collaborating to create standards for the exchange, management and integration of electronic healthcare information. 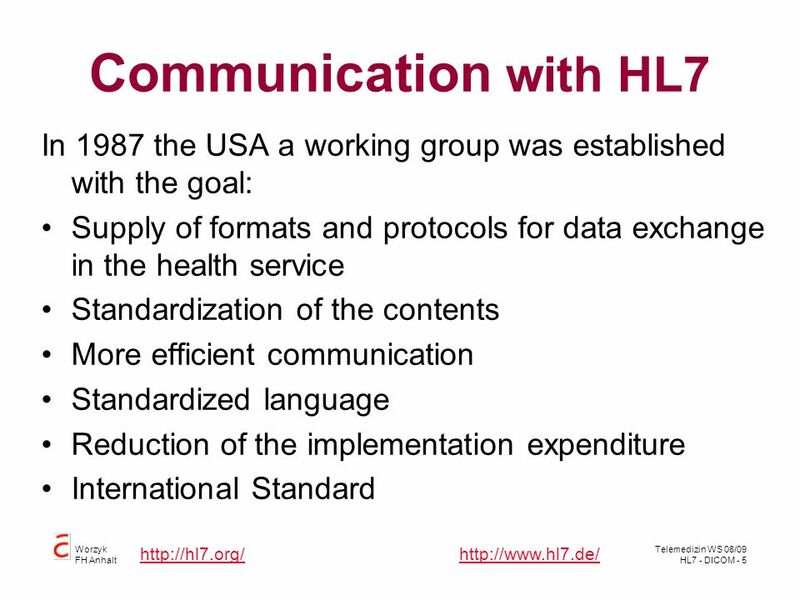 HL7 promotes the use of such standards within and among healthcare organizations to increase the effectiveness and efficiency of healthcare delivery for the benefit of all. 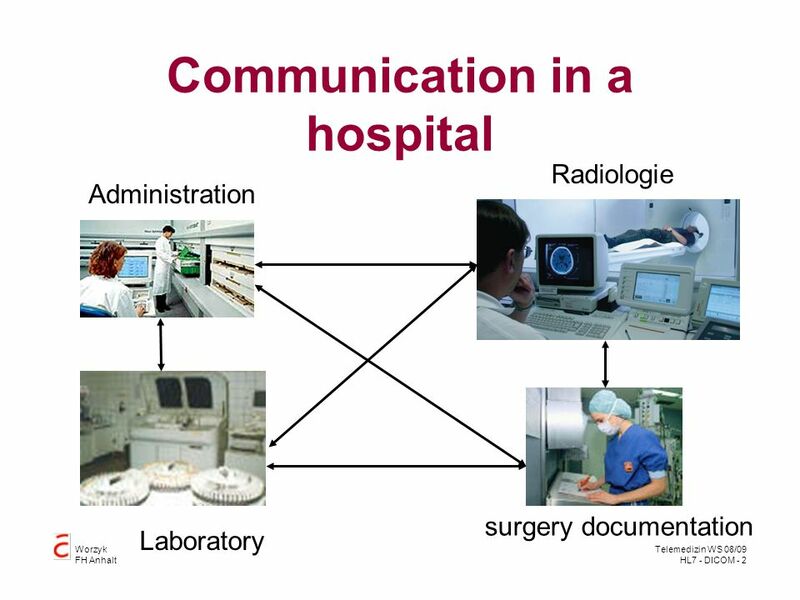 In the year 1983 the American college of Radiology (ACR) and the National Electrical Manufactures Association (NEMA) created a committee. 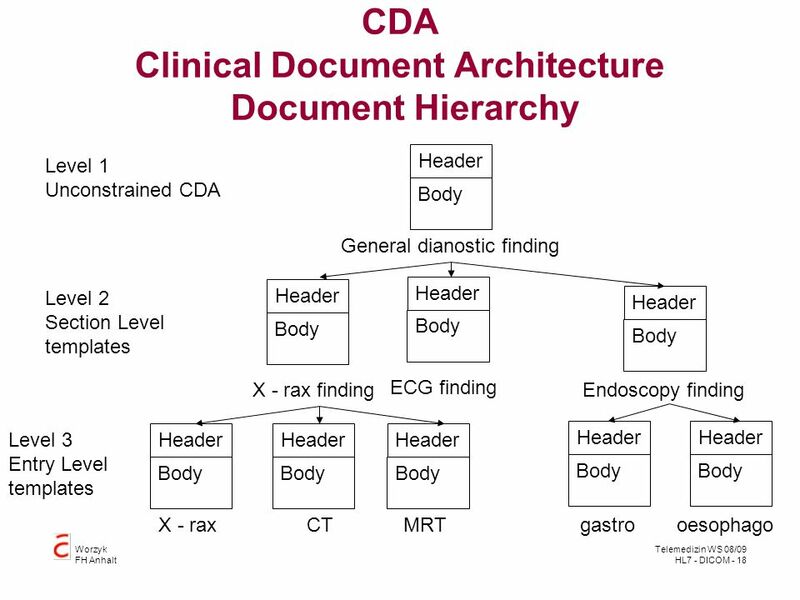 The goal was to develop a standard for medical pictures. In the year 1985 the first version of this standard was presented. 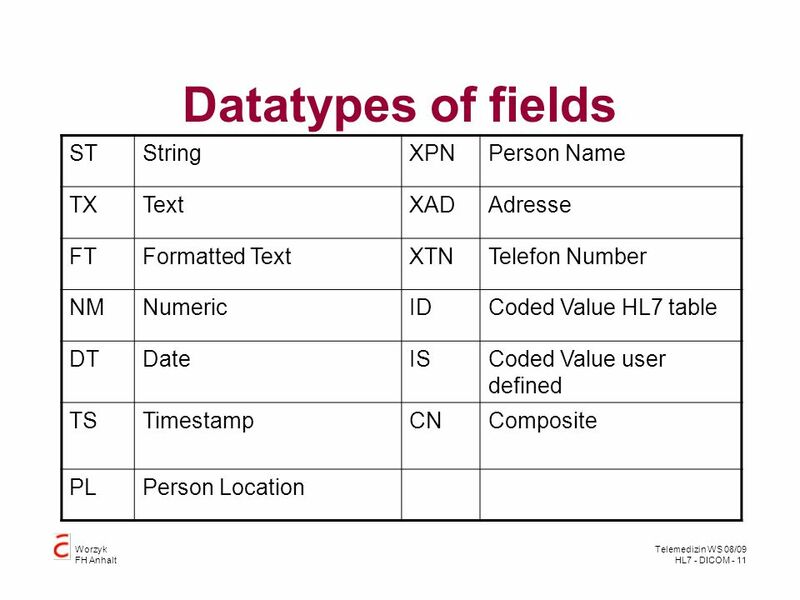 The file format and electrical point to point a connection between two devices were defined. 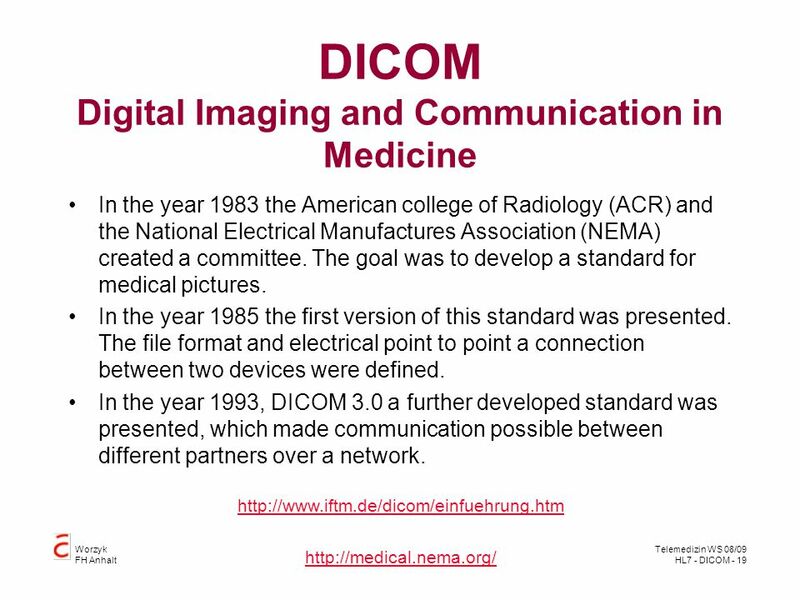 In the year 1993, DICOM 3.0 a further developed standard was presented, which made communication possible between different partners over a network. 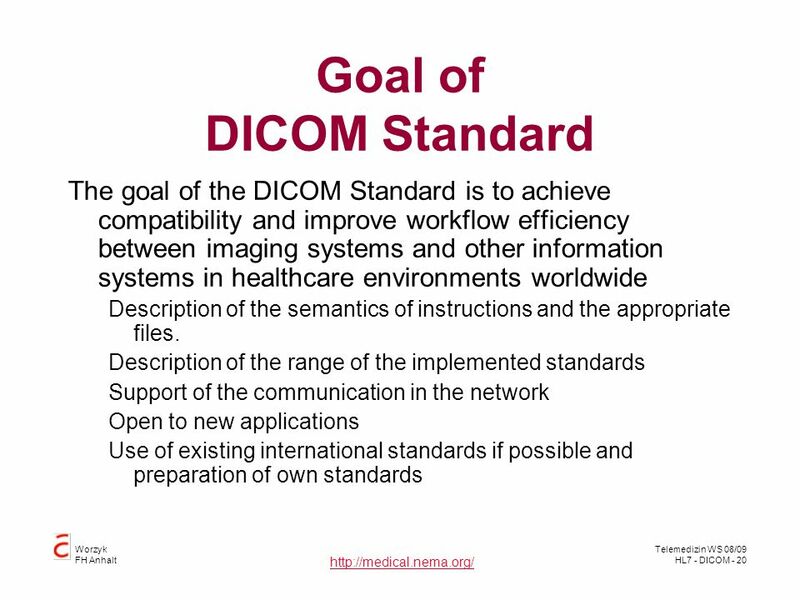 20 Goal of DICOM Standard The goal of the DICOM Standard is to achieve compatibility and improve workflow efficiency between imaging systems and other information systems in healthcare environments worldwide Description of the semantics of instructions and the appropriate files. Description of the range of the implemented standards Support of the communication in the network Open to new applications Use of existing international standards if possible and preparation of own standards Beschreibt den Umfang der implementierten Standards: Stellt eine Sprache zur Verfügung, mit der teilnehmende Systeme die bereitgestellten Dienste beschreiben können. 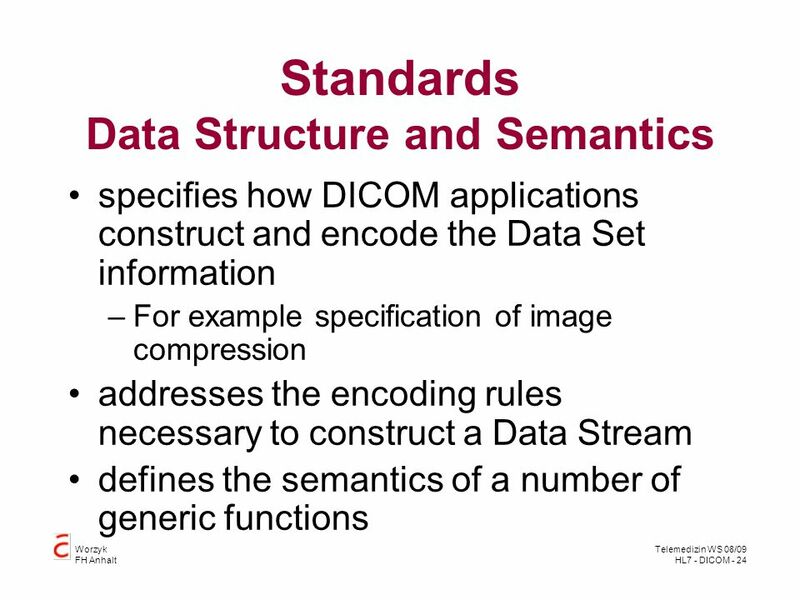 specifies how DICOM applications construct and encode the Data Set information For example specification of image compression addresses the encoding rules necessary to construct a Data Stream defines the semantics of a number of generic functions PS 3.5: DATA STRUCTURE AND SEMANTICS PS 3.5 of the DICOM Standard specifies how DICOM applications construct and encode the Data Set information resulting from the use of the Information Objects and Services Classes defined in PS 3.3 and PS 3.4 of the DICOM Standard. The support of a number of standard image compression techniques (e.g., JPEG lossless and lossy) is specified. 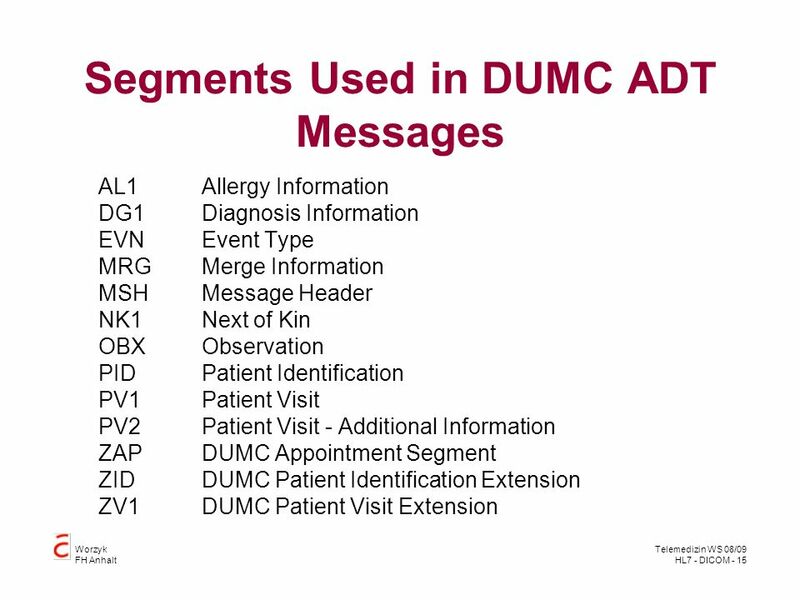 PS 3.5 addresses the encoding rules necessary to construct a Data Stream to be conveyed in a Message as specified in PS 3.7 of the DICOM Standard. 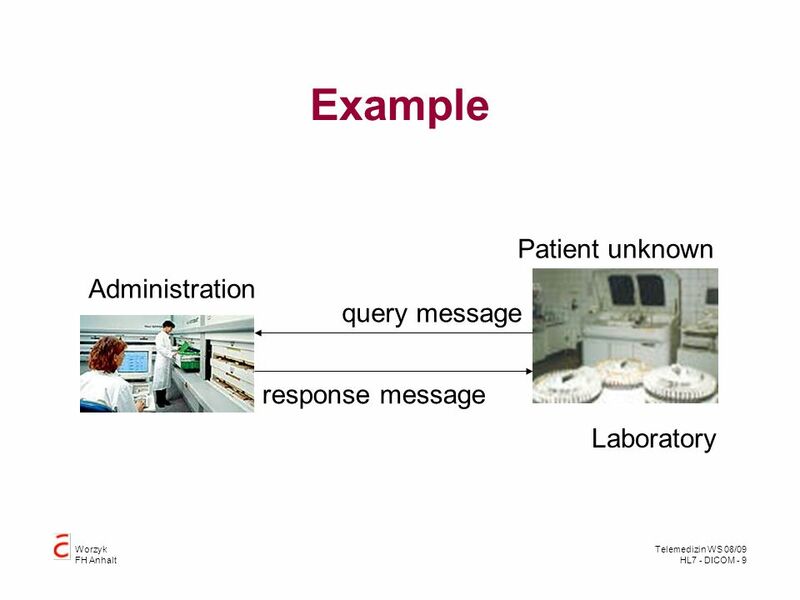 This Data Stream is produced from the collection of Data Elements making up the Data Set. PS 3.5 also defines the semantics of a number of generic functions that are common to many Information Objects. 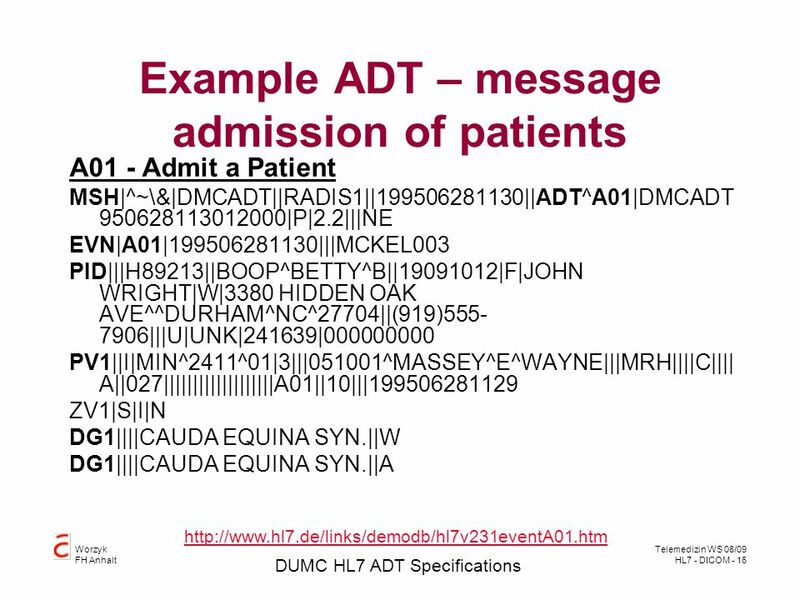 PS 3.5 defines the encoding rules for international character sets used within DICOM. 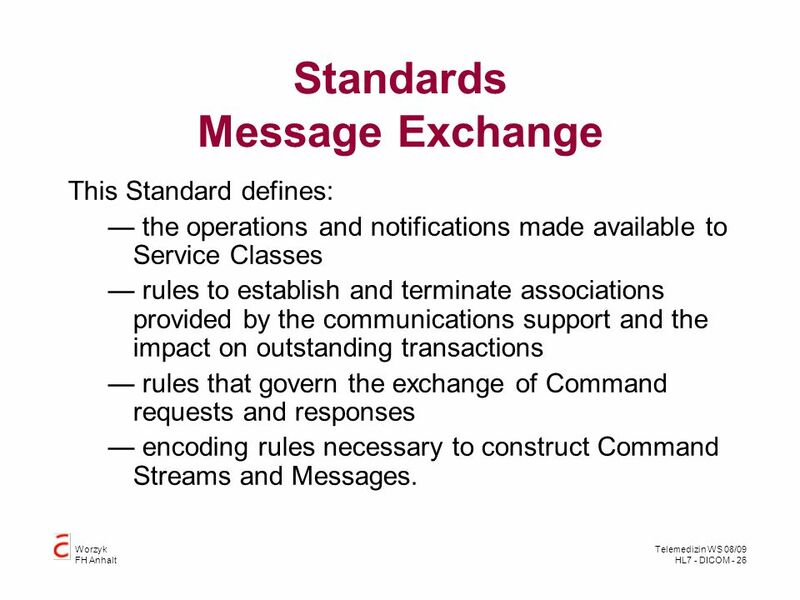 This Standard defines: — the operations and notifications made available to Service Classes — rules to establish and terminate associations provided by the communications support and the impact on outstanding transactions — rules that govern the exchange of Command requests and responses — encoding rules necessary to construct Command Streams and Messages. 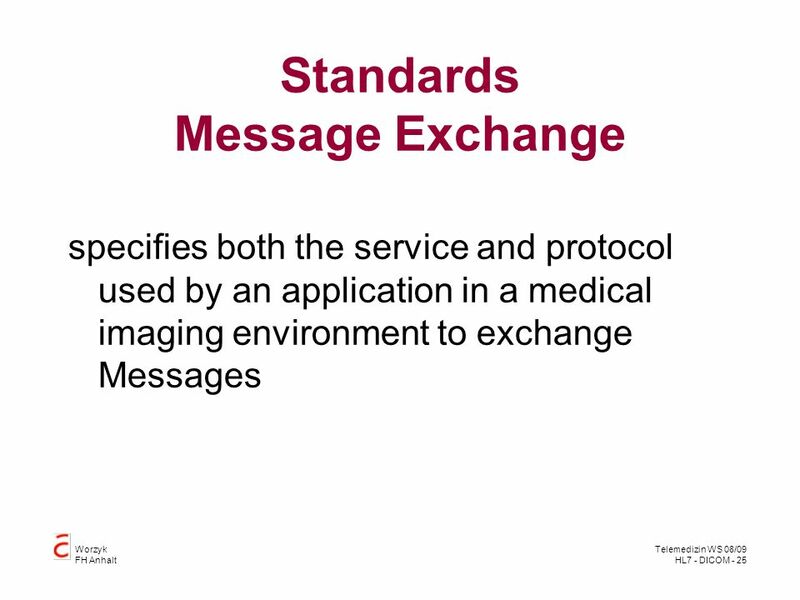 PS 3.7: MESSAGE EXCHANGE PS 3.7 of the DICOM Standard specifies both the service and protocol used by an application in a medical imaging environment to exchange Messages over the communications support services defined in PS 3.8. 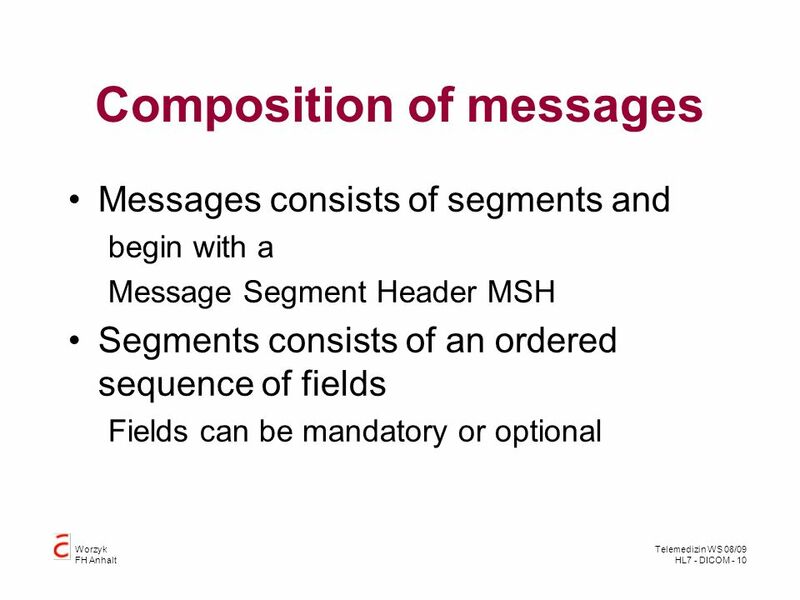 A Message is composed of a Command Stream defined in PS 3.7 followed by an optional Data Stream as defined in PS 3.5. 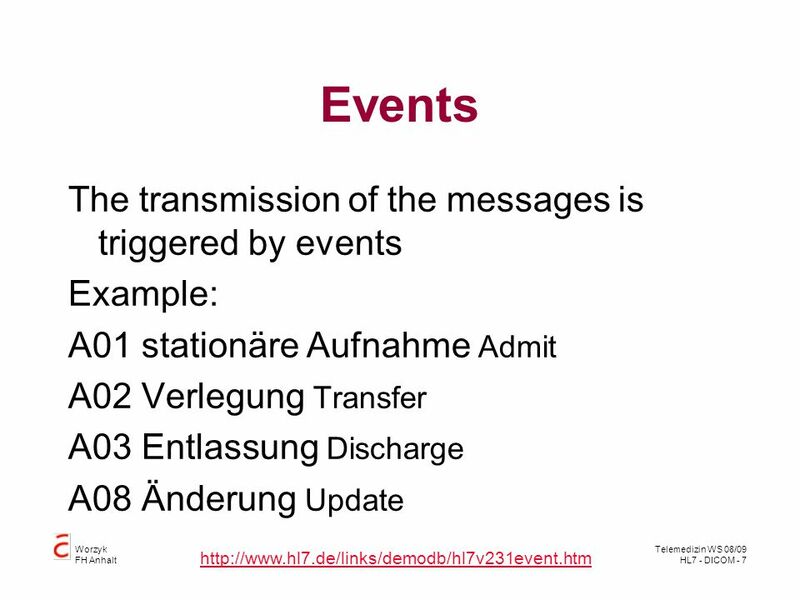 PS 3.7 specifies: — the operations and notifications (DIMSE Services) made available to Service Classes defined in PS 3.4, — rules to establish and terminate associations provided by the communications support specified in PS 3.8, and the impact on outstanding transactions — rules that govern the exchange of Command requests and responses — encoding rules necessary to construct Command Streams and Messages. 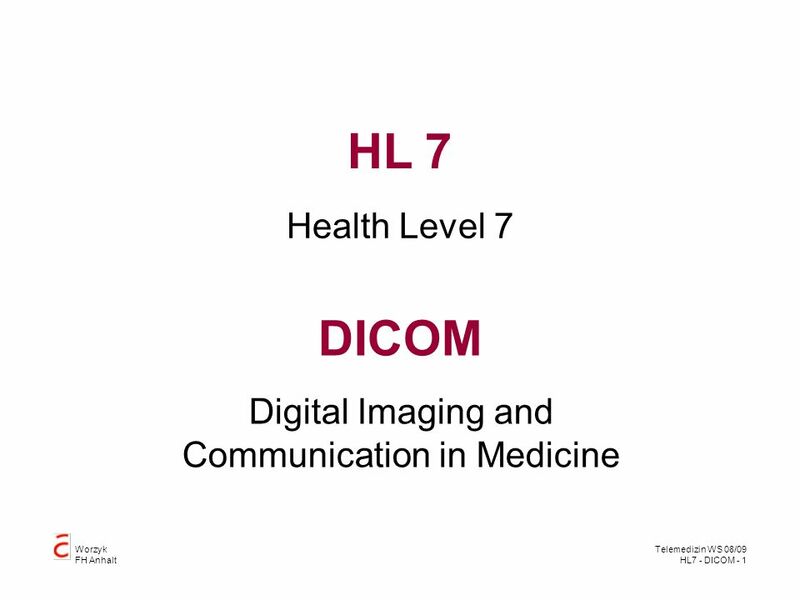 specifies application specific subsets of the DICOM Standard to which an implementation may claim conformance. 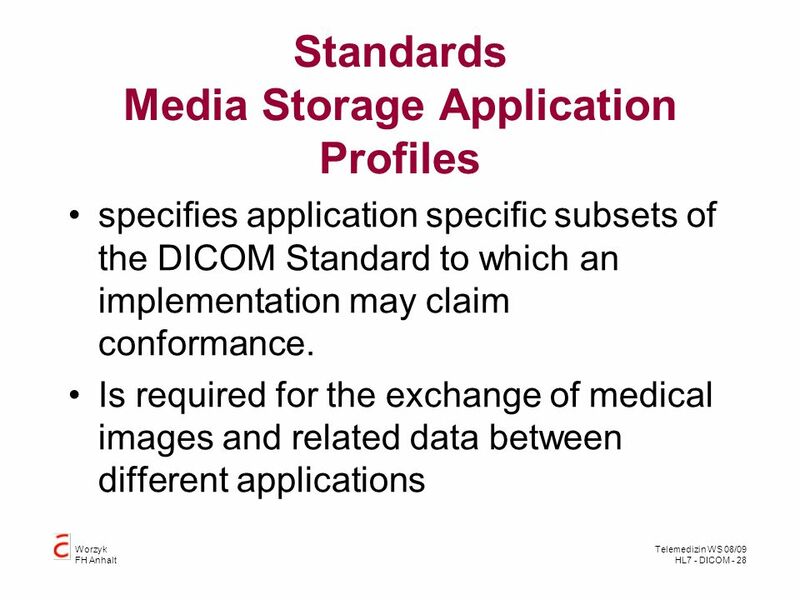 Is required for the exchange of medical images and related data between different applications PS 3.11: MEDIA STORAGE APPLICATION PROFILES PS 3.11 of the DICOM Standard specifies application specific subsets of the DICOM Standard to which an implementation may claim conformance. 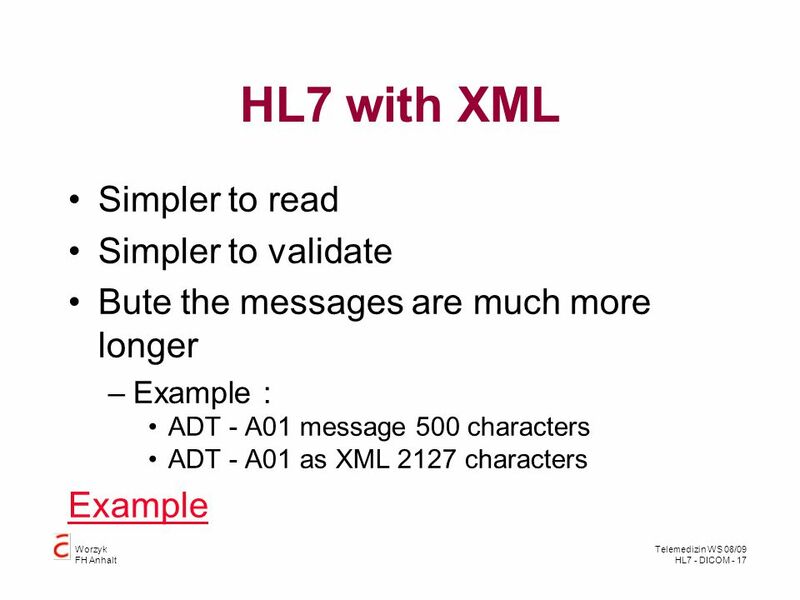 These application specific subsets will be referred to as Application Profiles in this section. 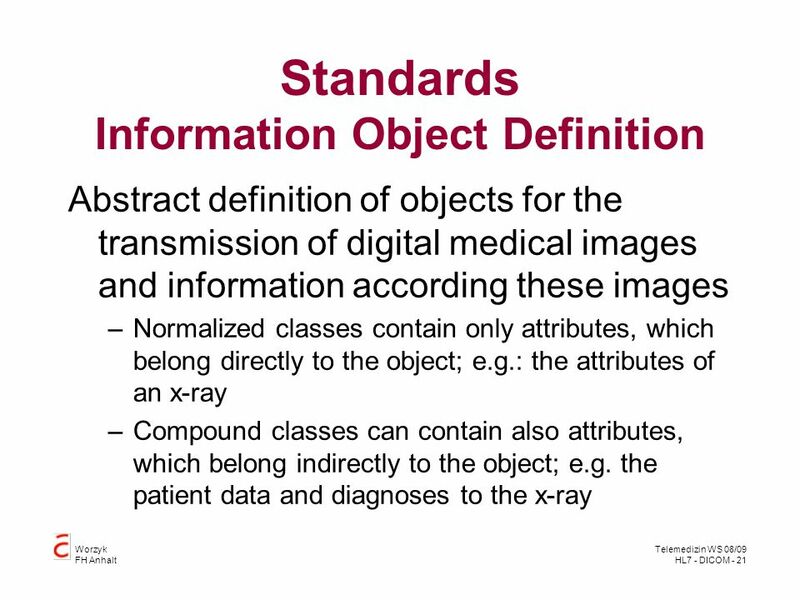 Such a conformance statement applies to the interoperable interchange of medical images and related information on storage media for specific clinical uses. 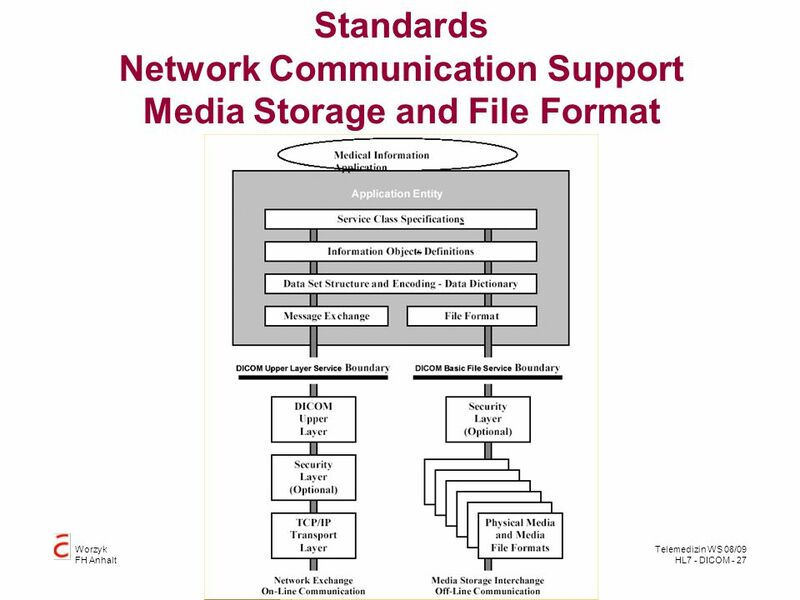 It follows the framework, defined in PS 3.10, for the interhcange of various types of information on storage media. 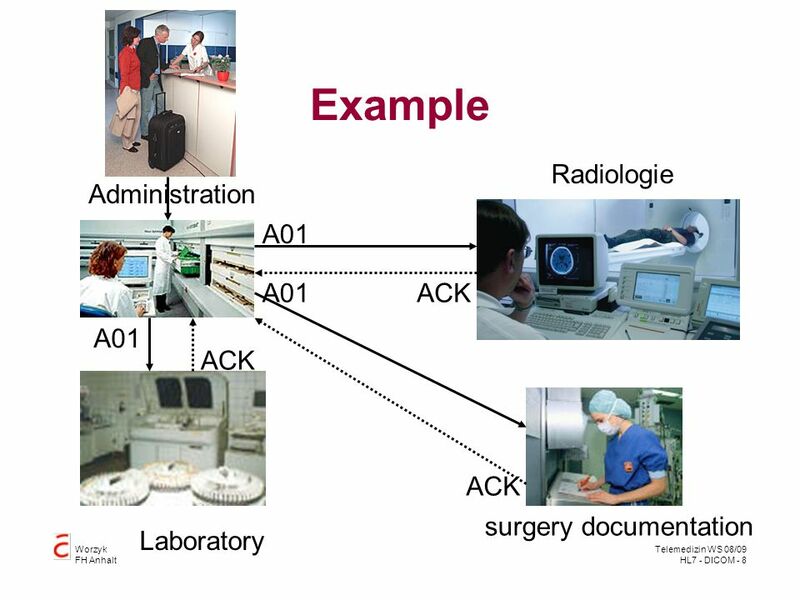 An Application Profile annex is organized into the following major parts: a) The name of the Application Profile, or the list of Application Profiles grouped in a related class b) A description of the clinical context of the Application Profile c) The definition of the media storage Service Class with the device roles for the Application Profile and associated options d) Informative section describing the operatinal requirements of the Application Profile e) Specification of the Information Object Classes and associated Information Objects supported and the encoding to be used for the data transfer f) The selection of media formats and physical media to be used g) Other parameters which need to be specified to ensure interoperable media interchange h) Security parameters which select the cryptographic techniques to be used with secure media storage Application Profiles The structure of DICOM and the design of the Application Profile mechanism is such that extension to additional Information Object Classes and the new exchange media is straightforward. 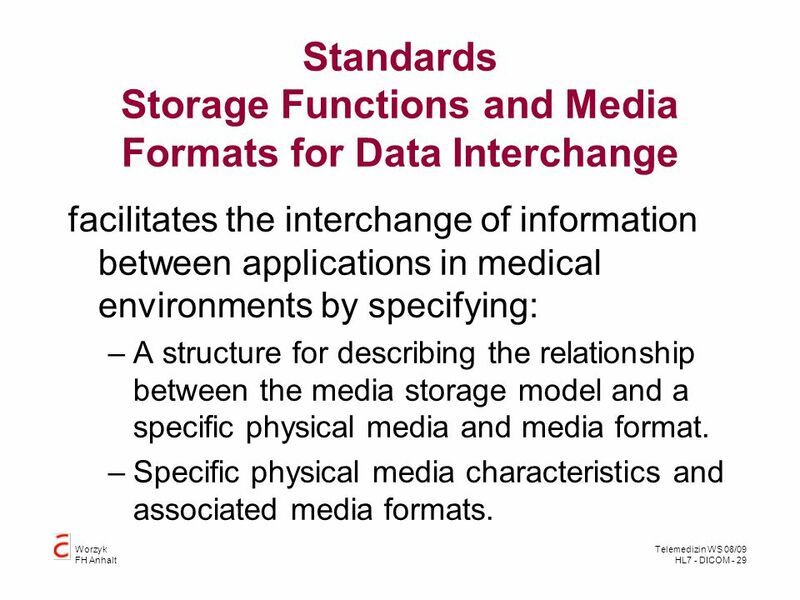 facilitates the interchange of information between applications in medical environments by specifying: A structure for describing the relationship between the media storage model and a specific physical media and media format. 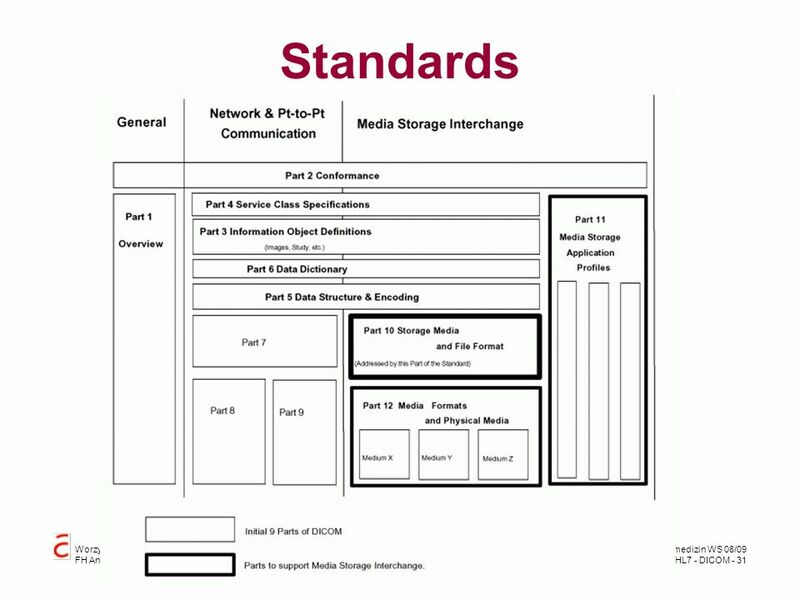 Specific physical media characteristics and associated media formats. 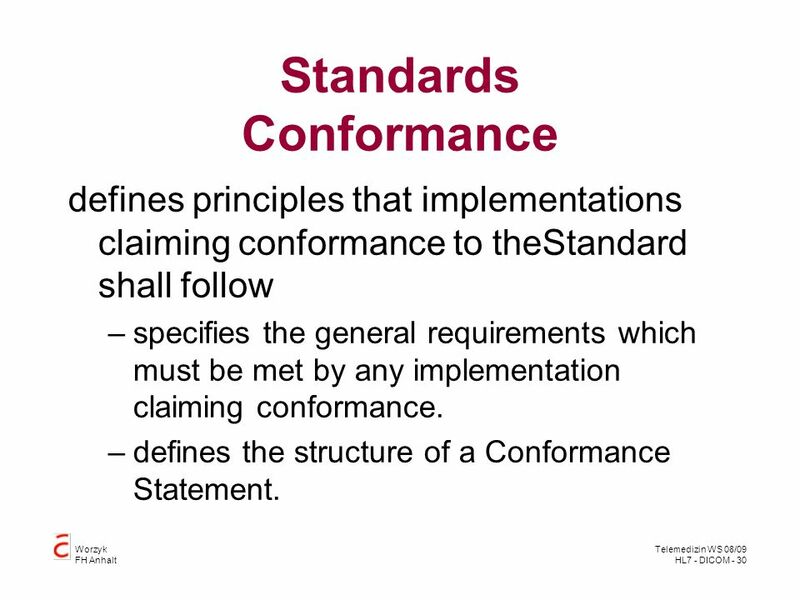 defines principles that implementations claiming conformance to theStandard shall follow specifies the general requirements which must be met by any implementation claiming conformance. 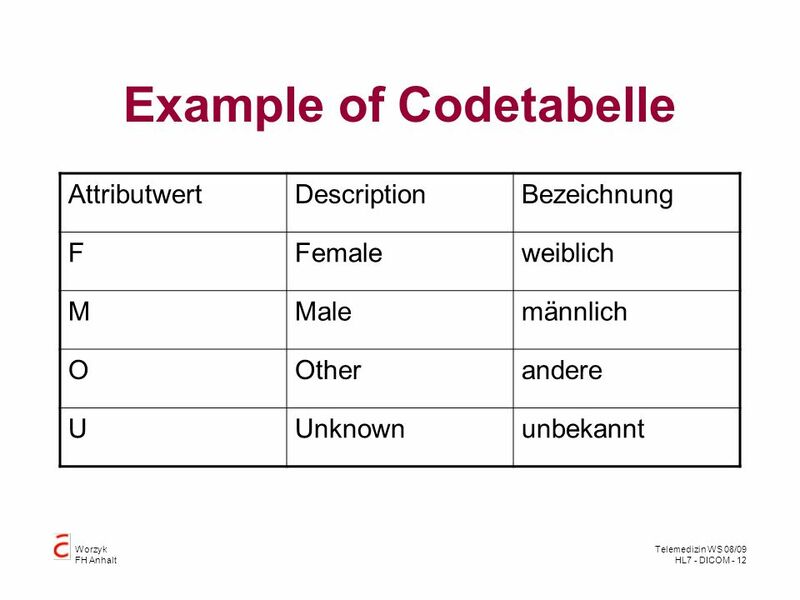 defines the structure of a Conformance Statement. 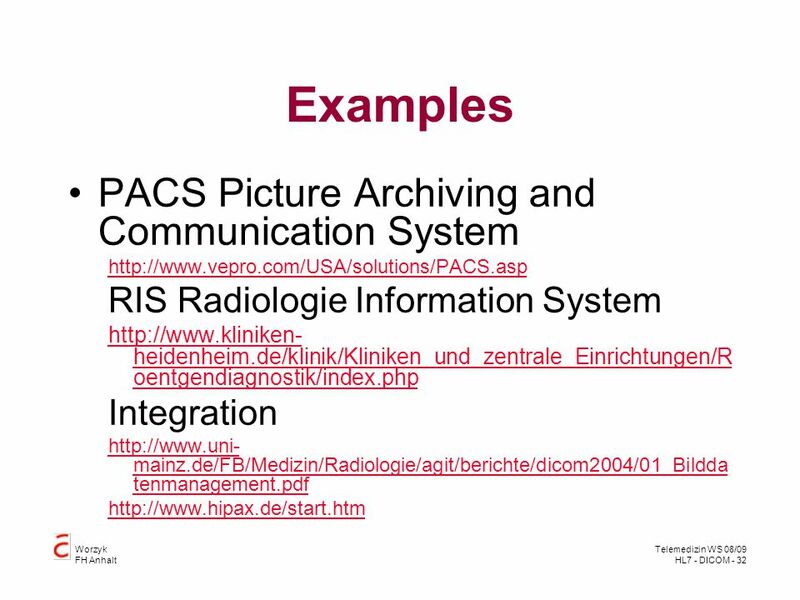 PS 3.2: CONFORMANCE PS 3.2 of the DICOM Standard defines principles that implementations claiming conformance to the Standard shall follow: — Conformance requirements. PS 3.2 specifies the general requirements which must be met by any implementation claiming conformance. 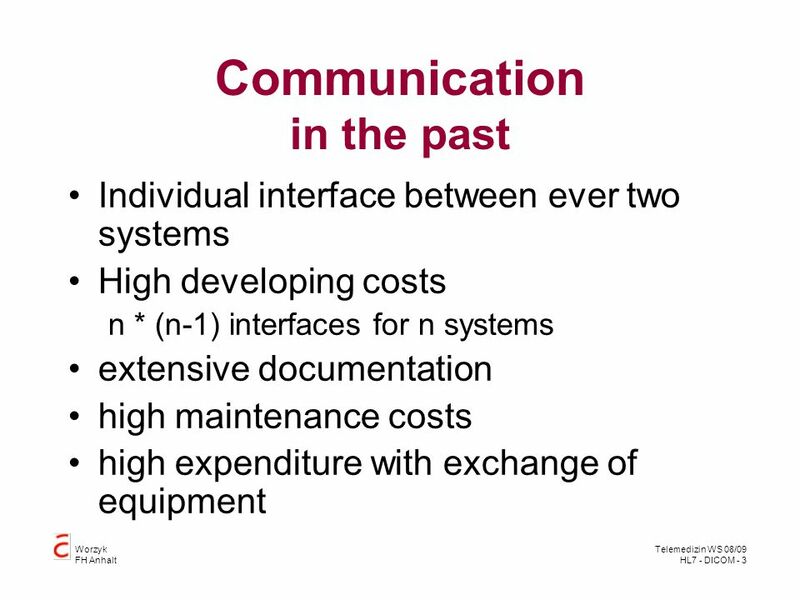 It references the conformance sections of other parts of the Standard. — Conformance Statement. PS 3.2 defines the structure of a Conformance Statement. 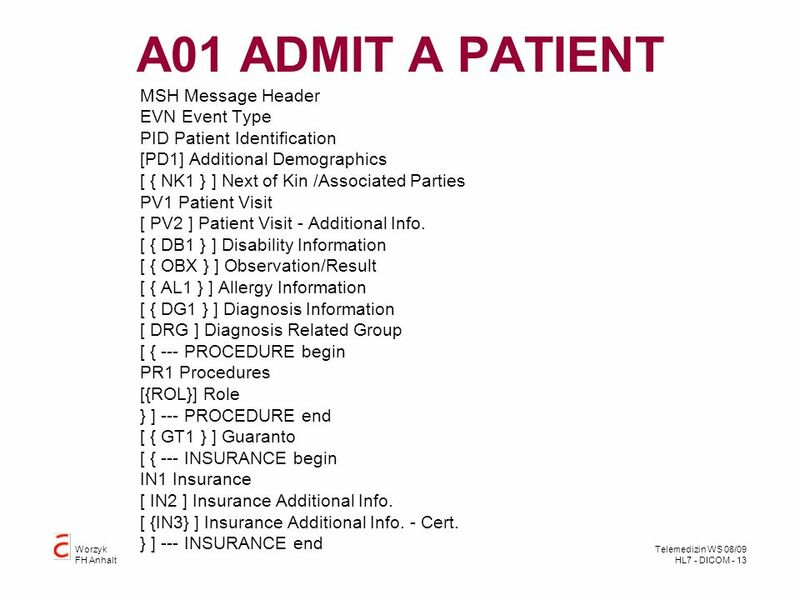 It specifies the information which must be present in a Conformance Statement. 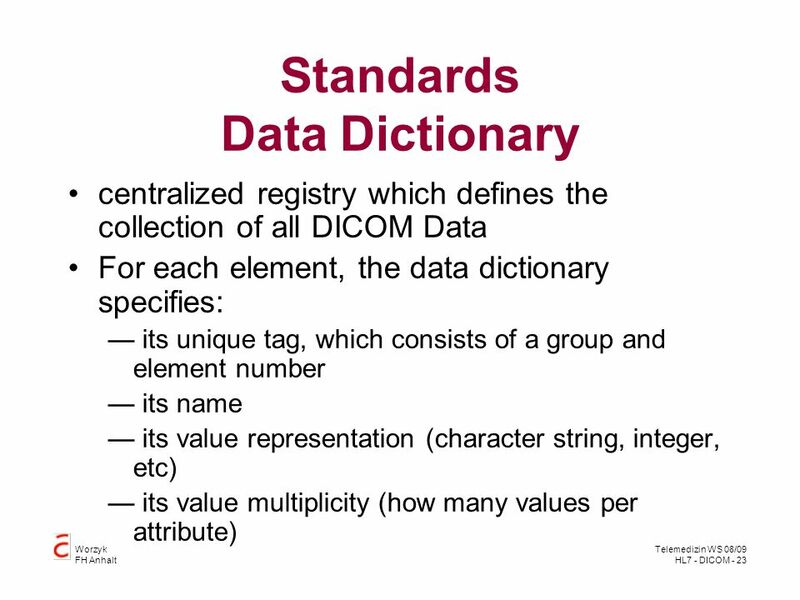 It references the Conformance Statement sections of other parts of the Standard. 31 Standards Conformance: Anforderungen an die Konformität, die eine Installation erfüllen muß, wenn sie erklärt, sich konform zu verhalten. Definition des Befehls, mit dem die Konformität erklärt wird. 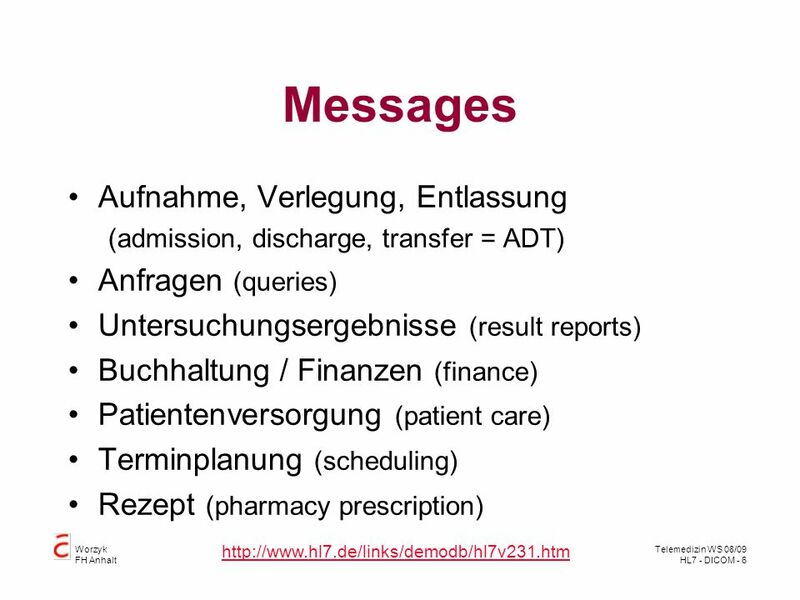 Download ppt "Digital Imaging and Communication in Medicine"
Worzyk FH Anhalt Telemedizin WS 09/10 XML - 1 XML Extensible Markup Language. Copyright © 2003 Pearson Education, Inc. Slide 7-1 Created by Cheryl M. Hughes, Harvard University Extension School Cambridge, MA The Web Wizards Guide. 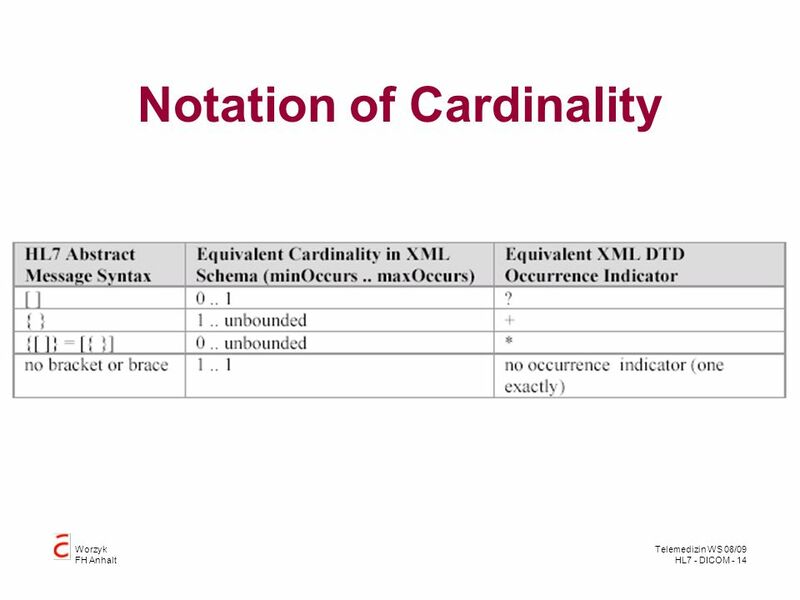 Pathfinding Session: Cardiology IHE North America Webinar Series 2008 Harry Solomon IHE International Board GE Healthcare. Sept 13-15, 2004IHE Interoperability Workshop 1 Integrating the Healthcare Enterprise Post-Processing Workflow Sanjay Jain Co-Chair, Radiology Planning. IHE Workshop – June 2006What IHE Delivers 1 Kevin ODonnell Toshiba Medical Systems Scheduled Workflow: The First Profile.